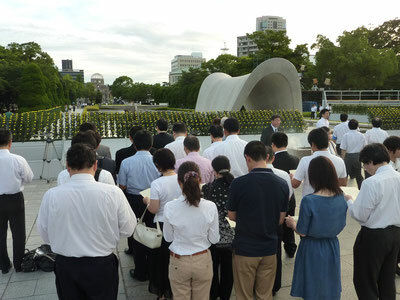 It has been 69 years since the Atomic Bomb had been dropped on the two cities and it haunts us forever. It took very little time to kill more than 100,000 truly innocent people in total. When we overcame the burning red-hot storm, we only saw the dark barren land and piles of casualties. Even in such an unimaginably extreme landscape, people who were lucky enough to survive helped each other, encouraged themselves, served water to those people who were about to ascend to heaven during their very last moments, and buried remains in the field, expressing profound respect from their hearts. People who could escape the attack visited the burnt out land by any means possible and kept saving victims. We are now extremely proud of their orderly deeds, and their dignified and selfless spirit revealed in their countless voluntarily actions. Although time enabled most of them to go to heaven, the strong voices from their remains, their meaningful actions and pride in their achievements… all of those　still echo in our minds and we are very touched and even heart-broken. We are here now to politely bow our heads, and express our sincere respects for our ever-lasting gratitude to them. Right now, we still witness endless conflicts and these are still occurring, with lesser examples of the U.S.-led interventions outside their country. The disastrous civil war is on in Syria, and Iraq is on the edge of collapse as a state with much domestic conflict. Russia’s annexation of the Crimean Peninsula and the following domestic battle in Ukraine are virtually accepted by Europe, whose natural gas sources depend on Russia, and the Indian Ocean became dangerous waters because of slowing self-defense requirements in India that depends on Ukraine. This means an indirect threat to our country. The Nuclear issue in Iran is leading to the confrontation between the U.S. and its European allies and the China-Russia bloc, and we are trapped to choose to recognize a Nuclear Iran, or to close the Strait of Hormuz. This means a direct threat to our country. And in Asia, China is moving against the countries around the South China Sea in order to enhance its clout with military posturing in an aggressive way. China’s provocative action towards our Senkaku Islands is only increasing. The same story applies to the situation regarding the development of ballistic missiles and Nuclear weapons in North Korea. The delicate balance which has managed to keep global peace and safety has now broken down, and we are in a situation where permanent members of the Security Council themselves forgot the important commitments to the U.N. and instead are seeking benefits for their own countries. 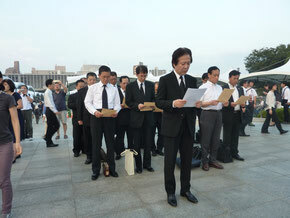 What happened to the meanings of the regulations in the Constitution of Japan, "the justice and faith of the peace-loving peoples of the world" and "no nation is responsible to itself alone"? In fact, the pacifism which we have long held as the ideal motto turned out to be a mirage which an army commander has produced in secret during the occupation of our country after World War II, according to the historical documents. 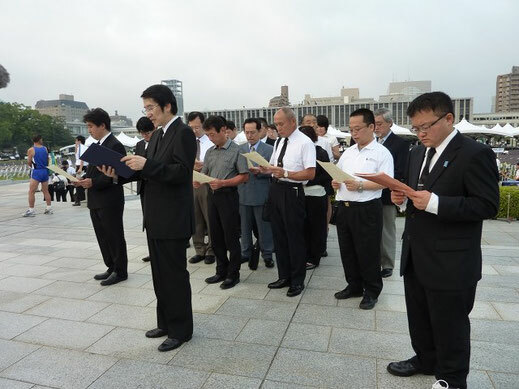 Before the birth of the Constitution of Japan, there was a line "Japan relies upon the higher ideals which are now stirring the world for its defense and its protection" and this concept became most important part of the Constitution. However since the end of war, victor nations rapidly started to show their military power in order to recover their influence prior to the war, and they actually proceeded to do so in certain areas; France and the Netherlands for the South East, the U.K. for its former colonies around the world, Soviet Union for the land in Poland and Finland, and the U.S. for the Pacific Islands. And just before the International Military Trial Far East, the Supreme Commander of the Occupation Army suddenly established the definition of crimes which never existed before the War, and judged against only Japanese, with no other legal action against members of the Allied Forces who committed same crimes. Even Mr. Thorpe, who was then a Commodore in GHQ and in charge of listing the war criminals, later confessed about the foregoing Trial that "the crime, starting the war under the national policy, was defined after the War, and this amounts to an ex-post facto law of hypocrisy for the court of torture." The Supreme Commander MacArthur in GHQ also testified at the U.S. Congress that "Japanese purpose, therefore, in going to war was largely dictated by security." Yes, we have long enjoyed peace and prosperity after the War. However, if we continue to be viewed as criminals, and accept that judgments with no knowledge of the reality of global society, and hold a groundless motto of "Blind Pacifism," that equals meaningless disregard for the toil and endeavor of our ancestors who fell in the war but reworked the ruins. The U.S. dropped the Atomic Bomb, even after they were notified about the Japanese intention to surrender right after the battle in Okinawa. The Great Tokyo Air Raid killed more civilians than the Atomic Bomb victims in a single night. The actions of both the Atomic Bombing and Great Tokyo Air Raid are obvious violations of International Law, to the point of indiscriminate attack on non-combatant people. Internationally speaking, even during the war time, we should follow International Rules we have previously established, the International Humanitarian Law. 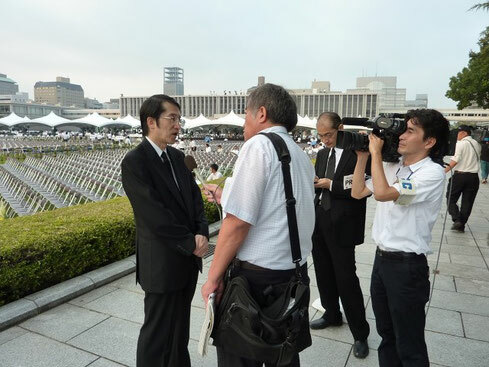 Even a commander of the Great Tokyo Air Raid recognized his action constitutes a war crime. 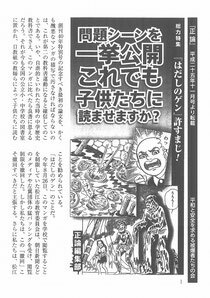 The story "Barefoot Gen," which has been decorated as an educational material to promote peace, is in fact targeting utterly the wrong people as criminals. Moreover, this material also ignores the fact that the U.S. planned and approved the attack on the Japanese mainland almost five months before the attack on Pearl Harbor and Japan expressed its intention to surrender before the Atomic Bomb disaster. These are distortions of real history. We can see the denial of our country by giving special treatment only to the Atomic Bomb survivors, and ignoring the dignity of the victims caused by other means than the Atomic Bomb. This appears to be elitism, the idea of being part of a chosen people. Although strongly declared by our Constitution "no nation is responsible to itself alone," we will not be able to restrict the actions initiated by each country, as international laws are superior to domestic laws. The international laws even allow the value of supremacy based on sovereignty, including the rights of belligerency. Moreover, many countries are now strongly committed to protecting their own security and prosperity by using any kind of means. The conflicts and wars between countries have been occurring before the birth of Nuclear weapons. Therefore, even if human beings could abolish Nuclear weapons, the confrontation or fight between countries would not disappear. So, we hereby voice up: We never choose only the Atomic Survivors as the missionaries of peace by the phrase "Let's not make memories fade out". 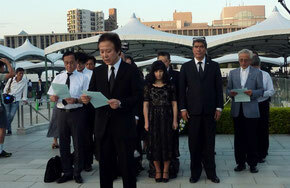 We reject the notion that the Atomic bomb survivors are to exist only to ask for compensation from others. We open our eyes to the reality of global society and face the regulations of International Laws, instead of reciting "total ban of nuclear weapons" that is being voiced by others. 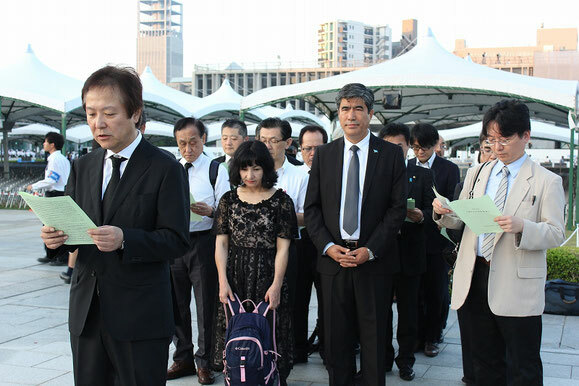 The things we must never make fade away are the memories of indiscriminate mass murder of civilians, and the strong voices from the people who were groaning after nuclear exposure and facing their deaths: "Please take revenge for us… Mr. Soldier," "You bloody, America…," were their very final state of mind. The things we must not forget are the footsteps of the people who have never blamed to anybody, but reconstructed our cities and country in very humble ways. Without the security of our mother-land, we cannot say we have independent sovereignty. Without our independent sovereignty, we cannot find a definition of peace. For our country and for our future generations, we hereby make our resolution: we overcome the mirage of "Blind Pacifism," and make a strong commitment to our endeavors for a truly ever-lasting peace and guarantee of security. To prevent ever repeat of such illegal error! to seek peace and security"